Commentary, from DailyGospel.org: St. Jerome tells us to "understand that you cannot get involved in Holy Scripture without a guide who will show you the way." St. Jerome in his commentary tells us that there are witnesses to be had. The writers of the Scriptures are sure witnesses, but there is more. In the time of Christ, he contended with men who looked to Scriptures as their guide, and even enjoyed the light of St. John the Baptist for a time, but something kept them from accepting the Lord: they lacked "the love of God" in them. The love of God is Christ himself, and communion with him is necessary, but they had too much pride to even consider it. What is at odds with the person of Christ is not Scripture but a closed mind that admits nothing outside of what is already known. For many among the Pharisees, they had Scriptures and their own understanding of it. Nothing else was to be admitted. This is dangerous for a believer because there is something greater than the written Word: "the Word made flesh" (John 1). There is something greater than our own understanding: the witness of the communion of saints, that "cloud of witnesses" (Hebrews 12:1), most of whom did not write Scriptures. The Bible witnesses to Christ but it is not the only witness to Christ. At the time of Christ, St. John the Baptist was a witness, beyond Moses who represents the witness of what was Scriptures at that time, prior to the New Testament. The love of God is rejected by pride. St. John Climacus tells us: "The proud man wants to be in charge of things. He would feel lost otherwise." Christ was not palatable to the men who liked being in charge. Today, many things of Christ, held from the very beginning but tossed out more recently, are rejected by many who may not realize that they close their minds in pride. I do not mean to doubt Scriptures like a ship tossed by every wave, but to have the open mind to look at other witnesses and see that they also speak of Christ, perhaps beyond what is told in Scriptures but not in opposition to them. There is no fear that the Bible will be found wanting because Truth can be verified and withstands all questions. St. Jerome tells us: "How many people today who claim to be educated hold a sealed Book in their hands! And they are incapable of opening it unless it is opened by 'him who has the key of David; if he opens, no one will close, and if he closes, no one will open.'" He does not mention the obvious reference to St. Peter and the keys here (Matthew 16:13-19), but he nails it nonetheless that "you cannot get involved in Holy Scripture without a guide who will show you the way." It is necessary to admit that one needs an authoritative (the keys) guide outside of himself. I have had some people tell me "I have the gospels, I am inerrant." Such thoughts are perilous. I hold Scriptures in the highest esteem, inspired and inerrant, but to deal with Scriptures alone, without a guide, is to court disaster. The disaster of pride that befell those among the Pharisees who kept like-minded people alone as their guide (other Pharisees who rejected Christ) who closed their minds to external witnesses like St. John the Baptist and the signs of Christ. The Lord tells us that he is more than Scriptures: "You search the scriptures, because you think you have eternal life through them; even they testify on my behalf. But you do not want to come to me to have life." What life? Christ tells us in John 6, vv 33, 35, 40, 47, 48, 51, 53, 54, 57, etc. "Amen, amen, I say to you, unless you eat the flesh of the Son of Man and drink his blood, you do not have life within you" (v53). The Eucharist truly is the source and summit of Christian life. In it is the entire mystery of salvation and sanctification. It holds in it the mysteries of the Incarnation and the grace of God. In the Eucharist is an intimate encounter with Jesus Christ, "the way, the truth and the life. "(John 14:6) [Further reading here. Non-Catholic resources here.] It is not so much that the Eucharist alone is the source of life in Christ, for we also encounter the Lord in Scriptures. However, the summit of life is Christ himself, who is witnessed to but is not contained exclusively within Scriptures. But if Christ is more than Scriptures, if we want to be so united with him beyond what we can read in Scriptures, then where else do we seek Him? In the flesh. We are to encounter Him mystically in His body and blood, in the Eucharist. We must encounter him in our neighbors, especially the least of us, "widows and orphans" and the poor. The communion of the Eucharist is both communion with Christ and, through Christ, communion with our neighbors, admittedly more complete with our brethren in the "household of God, which is the church of the living God" (Timothy 3:15). Which encounter matters the most? Let us not aim for the minimum required degree of communion. We must encounter Him in what opportunities are open to us. He is in Moses, the evangelists and the Scriptures. He is the Eucharist, the "bread of life" (John 6). He is in St. John the Baptist and in the great cloud of witnesses (Hebrews 12:1) in the communion of saints who are in the household of God. This is unbelievable, but sadly, not too surprising. That's how it is when one starts going down a slippery slope. (Found the link via Mark Shea). No punches pulled in this review. (Found the link via Mark Shea). Have questions about the holy rosary? This mini-site is an excellent first stop for quick answers. Further answers can be had from EWTN Q & A and from Catholic Answers. 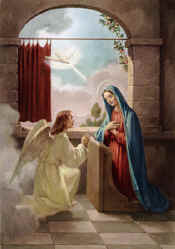 Saturday, 25th of March, 2006, is the feast of the Annunciation (Readings: Is 7:10-14; 8:10, Ps 40:7-8a, 8b-9, 10, 11, Heb 10:4-10, Lk 1:26-38). In this ancient feast, we celebrate the mystery of the Incarnation of our Lord and our Lady's humble obedience. It is both a celebration of God's graciousness and man's salvation. One should never be pit against the other, as if celebrating one makes the other worthless. How deep do we dig into the life of Christ to answer our doubts and misgivings about human suffering? There are truths that are not very obvious to many of us, but should be. Perhaps those who regularly meditate on the sufferings of Christ in the Rosary or in the Stations of the Cross are well aware of these truths, however. It is unfortunate that we often use prayer as a last resort, but prayer is more than supplication. Prayer, being a living relationship with God, means being intimate with him, whether or not we use words. Contemplative prayer is powerful not because we can cram all our supplications in it, but because we can be intimate with our God. It isn't because we can reveal our needs to God (because he knows our hearts better than we do, before we ask), but because God reveals himself to us best in prayer. It is when we are suffering that God wants us to draw near to Him, as a loving Father is the most tender when His child is stricken. God may seem to delay His response, but it may be "so as to give us even more than we are asking for." "Jesus teaches us that the first thing to do in these cases is to turn to God with prayer," said the Capuchin. But, he asked, what if one has already prayed to God without success? "Keep on praying ... with greater intensity," he said. The papal preacher said some might point out that Jesus' prayers to be freed from his trial and torment had gone unanswered. But God was listening, Father Cantalamessa said, he just had something else in mind; rather than have his son avoid the passion and death on the cross, "God's true, great fulfillment" of Jesus' supplication was his resurrection. My thanks to The Catholic Report for that story. So the question is, what can Australia's Therapeutic Goods Administration (TGA)do about this? The logical recourse for new data pointing to serious problems with a therapeutic drug is that there should be the possibility of restricting its consumption on safety grounds. A proper investigation might be called for. Here's new data, two new deaths linked to RU-486. On top of several others in the past which has prompted a ban on RU-486 in other countries. The Health Minister used to have the power to restrict the drug for such reasons, but legislation's already been passed and the TGA is now in charge. What can the TGA do about the new data? Unfortunately, it doesn't seem to have any ability to do anything. It was a serious concern by the Australians Against RU486 that the TGA "does not receive public funding and is dependent on the results of drug company trials and scientific studies". This was claimed by the recent Medical Director of the TGA, Dr McEwen. He also admitted that "his office is currently powerless to review a drug once it has been given market approval." Perhaps worst of all, he also revealed that guidelines set by the TGA are NOT ENFORCEABLE. Did Catholics invent fasting? For a good answer to that, read this primer. Is fasting a useless exercise? No. Physical exercise briefly denies the body of rest and relaxation. Dietary restrictions deny the body of certain unhealthy foods -- usually the ones that are the most pleasant. Athletes and health-conscious people understand the importance of such self-denial. They also understand the importance of discipline, which is an excellent result of such self-denials. In the same way, the Church has always understood the importance of self-denial through fasting. It's strange, however, that while athletes and health buffs are lauded for their discipline, Catholics and Orthodox are sometimes derided for their fasting. I know that one of the perceptions from the outside is that we fast because of a guilt-driven need to punish ourselves. Well, no, that would be insane and pointless. We fast because we need to master our appetites, to show our appetites who's boss -- our will. By our will we can then discern that those things which we craved, which we thought we needed, are not so necessary after all. By the same lights, we might realize that we're better off without them. To fast with the right attitude is to find out that we are more free than we thought we were. An odd insight tonight watching a cop show. Murderer kills daughter's lover to prevent offspring that would likely share a genetic trait that all three had: dwarfism. Strange self-hate. Could this give some insight as to why people today can be so callous about contraception and abortion? Why do people contracept or choose abortion? The issues are obviously complex and can't be oversimplified, but in many cases, there is a sense that eschewing either one is perceived to bring about something unthinkable, perhaps even abhorrent. I don't believe they feel that way about the baby itself, but they certainly might about the situation of having a baby. Now what would make a person feel that way about such a situation? I have three children of my own, and I know it can often be stressful, but not most of the time. Sometimes it seems to be so more than half the time, sometimes it doesn't. I also grew up with four siblings, and my memory is even better: mostly great, sometimes not so great. Maybe the key to understanding the decision to contracept or abort is by understanding two things: one's perspective of being a child in a family and one's perception of the parent's perspective when one was still a child. With the former, one might excessively worry that the unborn child might grow up in a miserable environment. With the latter, one might excessively worry that having a child would be a miserable predicament. I must see to it that my children enjoy their childhood, too, so that they will find childhood as something to be cherished and enjoyed, not something to be miserable about. I can also see how important it is that my children will have a balanced view of my parenthood. They should see (and hear) from my perspective that it can be stressful but that it is just as satisfying and joyful. Sigh. An apparent mixup between the what it is to be children of God whose image is Jesus Christ and what it is to be citizens of a democratically governed state. Too many people still think they can cast God in their own image, perhaps because they lack sufficient hope that the healing they long for really does need God's supernatural grace. Are they perhaps now thinking that God's image doesn't suit man? If they're saying that AIDS prevention requires condom promotion rather than the very effective chastity/abstinence/fidelity approaches of Uganda and the Philippines, then they may have lost hope in the ability of men and women to exercise reason and self-control. If they are saying that enabling the faithful to receive the Eucharist requires general absolution (prior confession not required), then they may have lost hope in the humility that men and women can exercise, apart from nullifying the call of the Gospels to confess our sins to one another. Esperanza! Spes! Hope! Can't go without hope! Well I suppose it's something that they've gone to the Magisterium with their gripes..
A cause for hope for those among us who want to see Roe vs. Wade challenged and hopefully overturned for a more sane law regarding abortion. SIOUX FALLS, South Dakota (Reuters) - South Dakota's state senate voted on Wednesday for an abortion ban aimed at giving the conservative-tilting Supreme Court an opening to overturn rulings granting women the right to the procedure. The legislation, passed by the state senate but yet to be signed by the governor into law, provides an excemption for cases where "the fetus dies during a doctor's attempt to save the mother's life." Read the full article from My Way News. Mark Shea writes about "the shadow tradition" that can appear to be associated with Sacred Tradition but is hardly part of it. Association can be confusing, but that's why we need the Magisterium: a certified (in both Scripture and Tradition), tried (2000 years and still functioning well), and guaranteed (by Christ's promise and the power of the Holy Spirit) teaching authority (delegated by Christ exclusively through his Apostles and in a special way through the chair of St. Peter) that makes the Church the pillar and foundation of truth. This is not to say that what the Magisterium teaches is always obvious or always easy to give assent to. But it is a power to bind and to loose that comes from our Lord, the head of the Church, and so we must give it assent even when its pronnouncements are neither easy to grasp nor to obey. On the other hand, we are called to observe all that the Lord has commanded through the Apostolic Church. We are not called to simply pick and choose which ones we like. Conversion Stories: What To Do With Them? And there's more out there. And they're all good stories to go around because one of them might just ring a bell for someone, someplace, and introduce them to the fullness of truth in the Catholic Church. By 1987, there were 112 cases of HIV/AIDS infection in Thailand and 135 cases in the Philippines. In 1991 the World Health Organization (WHO) AIDS Program forecasted that by 1999 Thailand would have 60,000 to 80,000 cases, and that the Philippines would experience between 80,000 and 90,000 cases of HIV/AIDS. During that same year the Minister of Health of Thailand, Mr. Viravedya, launched the heavy-handed, "100% Condom Use Program." All brothels were required to stock a large supply of condoms, and condom vending machines appeared in supermarkets, bars and other public places. This initiative was widely accepted by the people of Thailand. A year after this program was set loose upon Thailand (1992), the infamous Secretary of Health (now a senator), Mr. Juan Flavier, tried to implement the program in my own country, the Philippines. Flavier's efforts in the Philippines failed, however ..
.. and in 1999 the UNAIDS reported 755,000 total confirmed cases of HIV infection in Thailand-65,000 had died of the disease. That same year, in the Philippines, the total number of HIV cases was only 1,005. The disease had killed only 225 people. As of August 2003 there were 899,000 HIV/AIDS cases documented in Thailand and approximately 125,000 deaths attributed to the disease. These numbers are many times those projected by the WHO (60,000-80,000 cases) in 1991. These numbers contrast sharply with those of the Philippines where, as of September 30, 2003, there were 1,946 AIDS cases resulting in 260 deaths. The discrepancy between the numbers of HIV/AIDS cases in Thailand and the Philippines is particularly poignant considering that the Philippines is actually the more populous country. According to the U.N., Thailand has 66 million people. While according to the USAID-funded Commission on Population, the Philippines is now home to 82 million souls. "Spillage from condoms occurs as much as 65% to 75% of the time." Bjorklund and Gordon. Univ of Manitoba. Nov. 1990. "The rubber comprising latex condom has intrinsic voids about 5 microns in size." The HIV virus is 0.1 micron. Roland, Rubber World. June 1993. Roland and Sobieski, Rubber Chemistry and Technology. Vol. 62, 1989. And the success in the Philippines isn't a fluke. Exactly one year ago today (remarkable, that), I blogged about the decline of AIDS in Uganda. There were claims that the decline was due to deaths. That was based on unpublished findings by an unfinished research project. Oddly enough, I cannot find further publications on the topic since 1999 by the lead researcher. So where are the results to back up that claim? On the other hand, I did find this article about findings to the contrary. It cites a Harvard report, "What Happened in Uganda?" (online here) by Dr. Edward C. Green et al. The report was submitted to the U.S. Agency for International Development (USAID). Dr. Green debunks the notion that mortality accounts for the drop in AIDS infections in Uganda. He instead cites the Ugandan ABC program (Abstinence, Being faithful to your spouse, and Condoms only in high risk situations) as the leading factor. There were later some irregularities cited in the Citizen's Magazine report about how Dr. Green's report was shelved and how he was replaced by a condom advocate instead. Read more from my original blog and the Citizen Magazine reports here (Part 1) and here (Part 2). So it seems that the big AIDS and abortion advocates use the same tactics, too. Hide the facts, shout the lies louder to drown out the truth, and obscure the issues. Disgusting.